"Art from the Northern Plains" celebrates the Museum’s recent acquisition of a late nineteenth- century Lakota painting of a Sun Dance ceremony. To understand and appreciate its significance, this exhibition brings together a selection of historic and contemporary artworks by Native and non-Native artists who have worked in this region. Unidentified Lakota artist, "Sun Dance Ceremony," ca. 1895. Bowdoin College Museum of Art. 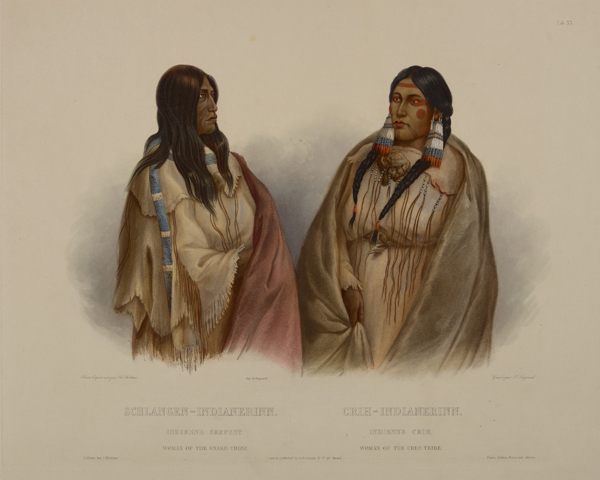 "Woman of the Snake Tribe, Woman of the Cree Tribe," 1839, hand-colored aquatint, etching, mezzotint, roulette, by Karl Bodmer, Swiss-French, 1809–1893. Bowdoin College Museum of Art. 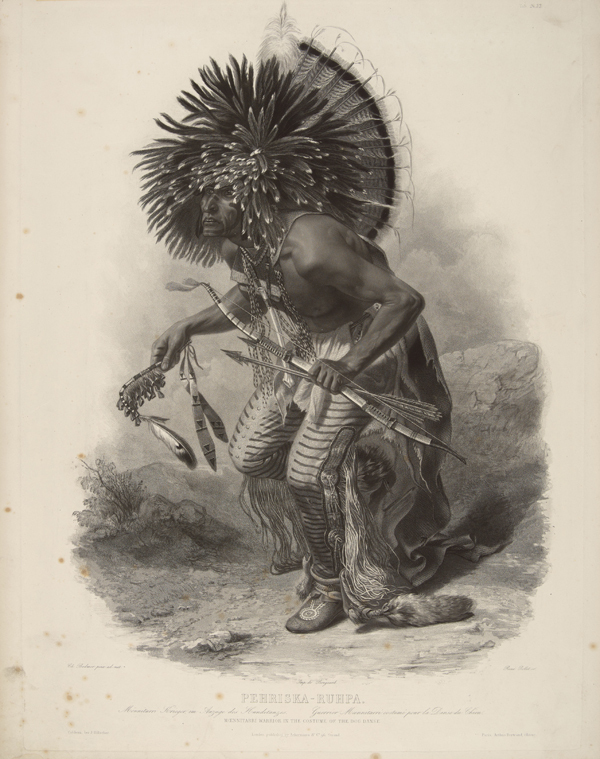 "Pehriska-Ruhpa, A Moennitarri Warrior in the Costume of the Dog Dance," 1841, aquatint, mezzotint, etching, by Karl Bodmer, Swiss-French, 1809–1893. Bowdoin College Museum of Art. "Hunting Scene," ca. 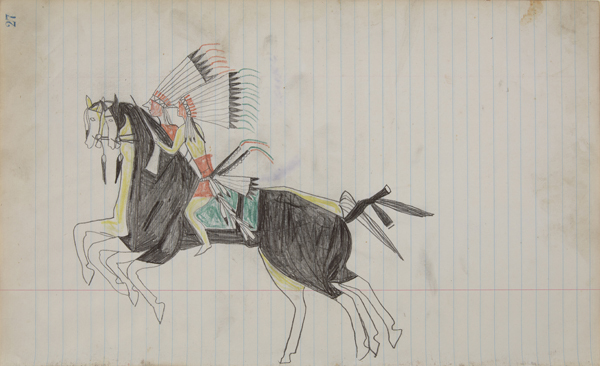 1875, graphite and colored pencil, by unidentified southern Cheyenne artist. Bowdoin College Museum of Art. "Two Horsemen," ca. 1890 , graphite and colored pencil,by unidentified Lakota artist. Bowdoin College Museum of Art. "Untitled," 2015, pigmented ink, by Francis Yellow, born 1955. Bowdoin College Museum of Art . Art from the Northern Plains celebrates the Museum’s recent acquisition of a significant painting on muslin of a Sun Dance ceremony by an unidentified Lakota artist. Created in the late nineteenth century, during a period when the U.S. government had outlawed the Sun Dance and subjugated tribes onto reservations, it attests to the continued Native resistance to American westward expansion, to the vitality of traditional ceremonies, and to evolving modes of creative expression within Lakota society. 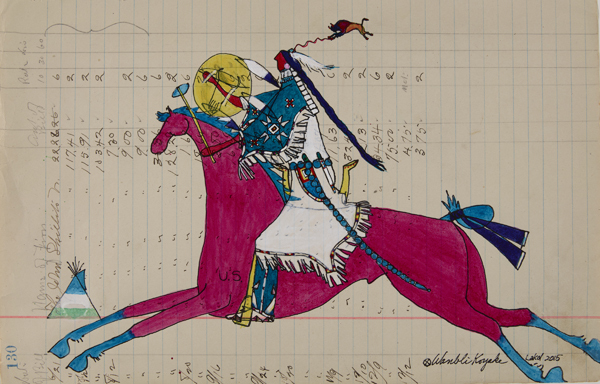 This painting’s artist was well-versed in Lakota pictographic traditions, yet at the same time utilized new artistic materials and was responsive to new audiences. For more than two centuries, the Northern Plains have been the site of dynamic, often contested interactions between Native and non-Native peoples. These exchanges have spawned vibrant work by artists from both within and outside this region. This exhibition brings together a selection of historic and contemporary art from the Museum’s collection that helps to contextualize the painting. Seen together, this group of art works testifies to the resilience of Native peoples on the Northern Plains and sheds insight into their historic and on-going relationships with the United States. Watch a video with Frank Goodyear, Co-Director, Bowdoin College Museum of Art speaking about The Sundance Ceremony painting. Read a news story about the exhibition.